Digidesign® Pro Tools M-Powered™ software is an exciting new version of the award-winning Pro Tools® software designed to work with select M-Audio® hardware peripherals. An ideal way to professionally record, edit, and mix music, Pro Tools M-Powered software includes many of the same features that top studios rely on to produce Grammy® Award–winning albums and Academy Award®–winning film sound. Pro Tools M-Powered software allows home studio users and people who need highly portable recording solutions to take advantage of the recording industry’s most popular audio/MIDI production software along with a variety of M-Audio interfaces. Users can also access additional products from Digidesign and Digidesign Development Partners designed specifically for Pro Tools, including the Command|8® control surface. 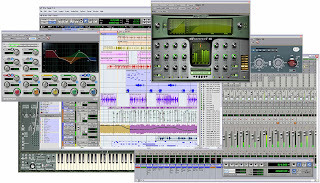 Pro Tools M-Powered software is easy to use and offers cross-platform support for both Windows XP– and Mac OS X–based computers. What’s more, sessions created with Pro Tools M-Powered software will open on Digidesign Pro Tools|HD® and LE systems, giving users instant compatibility with countless Pro Tools–equipped project and professional studios around the world. Does this version work with any type of soundcard? Hello Arthur, Here is a forum page with some questons on soundcards and Pro Tools. Do caralho, muito bom mesmo cara, sou brasileiro e aqui adoramos música!! Do caralho cara, muito bom mesmo. Aqui no Brasil adoramos música!